The recessed ceiling lamp Nashir by Axo Light is part of the Crystal Spotlight collection. The two small ceiling lamps feature a diffuser made of precious Bohemian crystal with metal fittings. Nashir's ornamental diffuser is shaped like a blossom and creates a fascinating halo on the ceiling, although most of the light is directed downwards. 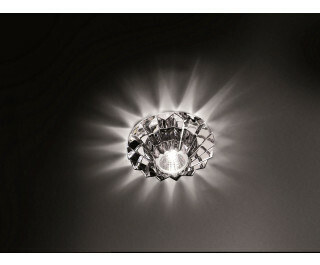 The Crystal Spotlight lamps are available as versions for high voltage and low voltage lamps.